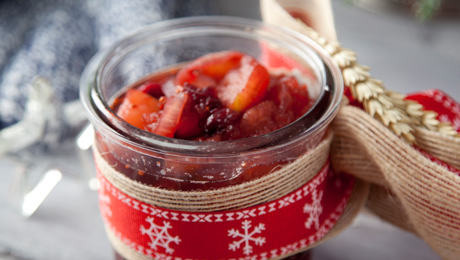 The perfect Chutney to accompany the perfect Christmas dinner. Place all the ingredients into a large heavy-based pan and bring to the boil. Reduce the heat to medium and cook, stirring occasionally, for about 1 hour, until the chutney has taken on a uniform brown colour and the flavours are combined. Pour the chutney into sterilised jars. Store in the fridge for up to 1 month once opened, or 9 months if sealed.